Species Total: 147 species for the trip. Species Total: 176 species for the trip. Species Total: 131 species for the trip. As my very first time in Pelee, I couldn’t have had a better guide than Jon. Birding with EOB is always incredibly fun and informative, but this trip was outstanding. Jon not only provided his usual amazing spotting and knowledge, he also designed a very well organized tour that guaranteed the best of all of the Pelee sites and trails (within the park itself as well as outside, such as Hillman Marsh and Rondeau Park) at the most optimal times of day for expected species. In addition to a smooth and flexible (rarities!) schedule throughout the day, including well-timed breaks and lunches, he also arranged dinner and evening birding options for the group. The days flowed seamlessly and Jon ensured an excellent experience for each individual. He is generous and approachable on any topic, and willingly shares his knowledge of bird behaviour, biology, song ID and field marks as we worked the trails. My favourite takeaway from the trip was how much I learned, particularly with regards to birding by habitat. I’ve already applied some new tips and perspectives to my local patch! I highly recommend this EOB tour for any birder, from beginners to advanced. Your Pelee experience will be top-notch! Bree Tucker, Ontario, Canada. I had a marvellous time in Point Pelee! Jon birding skills (and people’s skills!) made this trip so much fun. Everything was well organized. Everyone should go to Point Pelee at least once. Every day I get up wishing I could go birding and photographing birds. I cannot wait for my next outings with Jon. Carolle Marie Boudreau, Ontario, Canada. Jon Ruddy is a profoundly dedicated birder and a wonderful guide. I joined a group he led at Point Pelee in May 2018. What was impressive was that he not only knew everything about the bird life there but that he was so willing to share that knowledge, to teach rather than just to see. The trip was wonderful, as is Point Pelee. But Jon’s expertise and patience made the experience of being there better by a dozen times over. Robert Miller, Connecticut, USA. I had the good fortune of joining Jon Ruddy on a 3-day birding tour at Point Pelee in 2018. With his skill at spotting and identifying birds by both ear and eye, he helped me and his other clients see and identify well over 120 species, including 23 “lifers” for me. 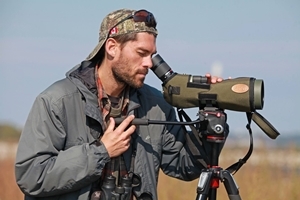 In addition to being a great birder, Jon is an excellent coach and teacher, enthusiastically imparting his knowledge and wisdom about how to identify birds, as well as their behaviour and habitat. Importantly, he is also a great tour guide, always thinking of the well-being and safety of his clients. I can’t wait for next year’s Point Pelee trip! Sheila Craig, Ontario, Canada.